Posted on Mon, Mar 19, 2012 : 8:03 p.m. Ticket prices in the Michigan Stadium student section increased by $2.50 per game for the 2012-13 season. For a third consecutive year, the Michigan football program is raising its student ticket prices. 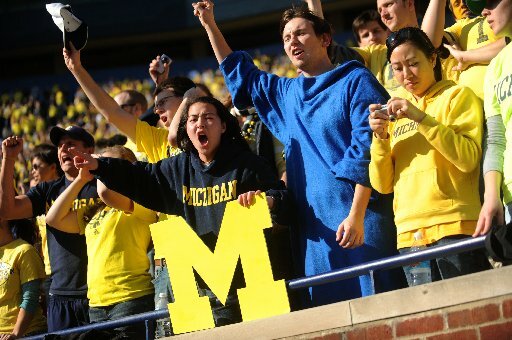 A 2013 season ticket will cost a current student $195 for six home games, according to mgoblue.com. There also is a $10 service charge. The base rate averages to $32.50 per game, a $2.50 bump from last year. That is a modest increase, especially considering the program is coming off its first 11-win season in five years and BCS win in 12 years. However, the price hike also comes in time for a season in which most of the marquee games are away from Michigan Stadium. After hosting eight home games in 2011 -- including premier matchups against Notre Dame, Nebraska and Ohio State -- the Wolverines' six-game home slate next year includes Air Force, Massachusetts, Illinois, Michigan State, Northwestern and Iowa. Only the matchup against the Spartans is considered marquee. Highly anticipated games against Alabama (in Dallas), Notre Dame, Nebraska and Ohio State are all on the road next year. Wed, Mar 21, 2012 : 4:08 a.m.
Would hardly call Moo U marquee. Wed, Mar 21, 2012 : 12:51 a.m.
Give Brandon a break! The athletic department only made 26 million last year. What's he supposed to do raise the price of pizza? U-Mass every two years is great entertainment for you guys. Since when is MSU a marque matchup? Losing to them has never been a big deal. Looks like Northwestern is the game to sell to have money for next years season. Is that the big re-match with Appy State? That one will fetch a fortune. Wed, Mar 21, 2012 : 5:30 a.m. It's worth noting that you're a complete waste of space and time on this forum. Tue, Mar 20, 2012 : 11:08 p.m. So tix are going up when seats where empty in the student section. Tue, Mar 20, 2012 : 11:03 p.m. The concept of a &quot;marquee&quot; game is something the athletic department came up with as an excuse to charge more for certain opponents. Any true Michigan fan is just as happy to watch Massachusetts as Michigan State. The privilege of watching Michigan football in person. The experience of being part of the largest crowd anywhere in America watching a football game. The excitement generated by over 100,000 people clapping in unison as the drums pound out the entry cadence for the band. These are the reasons we pay for tickets. Tue, Mar 20, 2012 : 9:15 p.m. I remember paying 14 bucks for a student season ticket in the early 70's, quenching my thirst from a Boone's Farm-laden bota bag, passing the coeds and empty wine bottles up row after row in the stands, and (most of the time, anyways) watched the Wolverines completely demolish their opponents. The little dog pushing a basketball with his nose from one endzone to another before the game was pretty cool. And songs from Zorba the Greek played throughout the Stadium. The cheerleaders climbing up, then flipping backwards from the brick wall surrounding the field for each point scored was entertaining, too. The Great Coach Schembechler on the sidelines and the Awesome Bob Ufer on the radio! We got our money's worth, that's for sure! Tue, Mar 20, 2012 : 2:49 p.m. Since the home schedule is shorter and lacks marquee games, I would have hoped the Athletic Department hold the line on student ticket prices for one year. It's not like ticket prices havn't gone up in a few years, quite the opposite. Tue, Mar 20, 2012 : 12:58 p.m. Given the fact that the Amhearst Minutemen will be playing in front of more people in Michigan Stadium than will be in attendance for their whole home schedule, I cannot believe that any true Michigan fan would not look at UMass as a marque matchup. Did you know.....Pioneer High will have a larger 2012 total home attendance than the Minutemen from Amhearst? Circle it on your calender today: In 2014 UM will be bringing Southwestern Wyoming A&amp;M Tech to the Big House!!!! Tue, Mar 20, 2012 : 12:16 p.m.
That guy in the light blue sackcloth has a woman on each arm and ringside seats so sign me up for a light blue sackcloth. The ticket prices are still a cheap thrilling date and you don't even have to talk or listen to your date. Tue, Mar 20, 2012 : 11:28 a.m. This guy in the light blue sackcloth...what's his problem? Tue, Mar 20, 2012 : 4:09 a.m. It's the cheapest things for students. I'd always sell one ticket- Notre Dame or OSU or Michigan state to pay for the other games. With today's college costs I'd have had to sell blood down on State street every day. Poor kids today. Tue, Mar 20, 2012 : 3:35 a.m.
RE: &quot;Only the matchup against the Spartans is considered marquee.&quot; -- And indeed it is: after all, who wants to miss the Spartans' return to The Decades of Humiliation At the Hands of Michigan?? Tue, Mar 20, 2012 : 2:28 a.m.
Those who stay will be........ in much more debt!! Tue, Mar 20, 2012 : 2:34 a.m.